Home Ringside How To Wash Boxing Gloves Properly! How To Wash Boxing Gloves Properly! Gloves are one part of being a top professional that has its perks, if you’ve reached the top then everyone wants them and it’s very unlikely that you’d ever have to worry about them. 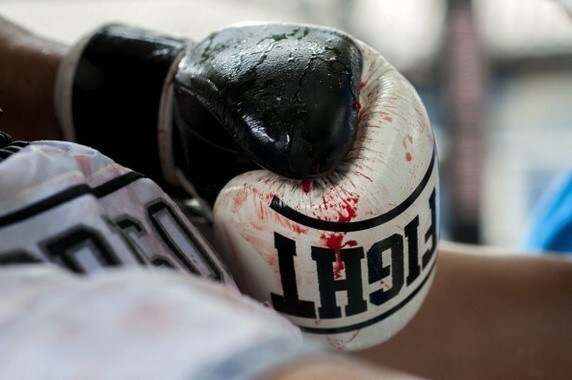 Fight-worn gloves of a world title holder are a proud asset to many. For everyone else in the boxing world, it’ll get to that moment when you simply have to take the plunge and give them a clean. There are two main reasons why you’ll have to clean your boxing gloves, and that is due to the smell and for hygiene purposes. Those two aspects are caused by the same thing, and that is bacteria. There are bacteria on your skin that gets transferred into your sweat, and those bacteria break down the acids in the sweat and create the odour. It’s not pleasant, but it’s true. That’s why you don’t smell as soon as you start sweating. Now if that doesn’t want to make you want to wash your boxing gloves, nothing will. In order to wash your boxing gloves then, you want to kill those bacteria. Killing those bacteria will stop them from spreading and therefore stop the odour that comes with it. So what is the best way to kill that bacteria? Well with most clothes you can simply throw them in the washing machine and the washing power and heat will do that for you. With boxing gloves, that is simply not possible as they aren’t machine washable. You don’t want to fill them with moisture and you don’t want to damage them with the violent action of the washing machine. All good boxing gloves are made out of leather, and it’s a material that while tough under most circumstances, actually needs to be taken good care of. Some line of thought is that you should put the boxing gloves into a saline solution. This would work, but there is more to it than that. Boxing gloves contain a lot of material and a lot of padding, submerging those gloves in water will fill it completely up with water which could damage the leather. Also though, the natural drying time for boxing gloves that have been fully submerged would be immense. By the time they have dried, more bacteria might have formed in the glove anyway. Quick drying methods would most likely crack the leather. Sometimes you are too tired to even think about how to clean boxing gloves after a session, but you need to at least take some precautions to stop that bacteria from growing any more than it should. One of those precautions is not leaving your gloves in your gym bag. If you don’t want to carry your gloves then simply take them out as soon as you get home so that you don’t give those bacteria their chance to grow. Being in a warm, air-restricted environment will get you an instant bad smell. Hand wraps are essential for protecting your hands and you should be wearing them at all times anyway, but preventing bad smells is another reason to keep them on. When you’re using gloves, most of that sweat will be taken by your hand wraps which will minimize any smell as unlike your gloves, re-usable hand wraps can just be thrown into the washing machine, and taped hand wraps will just be thrown away. In order to get as much moisture out of your gloves as possible, using a hand cloth will be able to soak up most of that excess moisture to prevent it from standing in your gloves. Once you have soaked up any excess moisture, then you’ll want to try and sanitize your gloves the best you can. One way to do this is by using a vinegar and water solution which you would then wipe around the inside of your gloves. While this would obviously add moisture, the vinegar will be killing the bacteria which will make your gloves more hygienic and take away their smell. Any solution that you use needs to kill those bacteria, and once they are killed then you can worry about making your gloves smell nice. It’s not just the inside of the gloves that need to be cleaned either, as the outside will also need some care and attention. It’s likely that sweat would have gotten on most areas of your gloves, either from yourself or your opponent. Use your cleaning solution to lightly brush over all of these areas in order to kill those bacteria. This will also remove any dirt that might be on your gloves and leave them looking like new. As your glove will most likely be made out of leather, there are other considerations here too as you will want to maintain the look and feel of the material. You probably would have seen those types of boxing gloves where they are starting to crack and showing their rough edges. When they get to that stage, then it’s time to throw them away. The reason for that is that leather like any skin can dry out over time, and one way to stop that is to use a leather conditioner that will restore the moisture in the glove. Once you have cleaned your gloves then it is time to dry them. By this stage, they will still be full of moisture, but won’t be full of that bacteria which causes the uncleanliness and the bad smell. As you can imagine, throwing them in a dryer would be a sure way to ruin your gloves as quickly as possible. The motion of the dryer would likely damage them and the heat could cause weakness in the bonding and would probably crack the leather. If you don’t want to clean your gloves of bacteria every time they are used, then it’s still important to make sure they dry as quickly as possible as this will keep them fresher for longer. It will also prevent that horrible moment that many people have had, where they re-apply their boxing gloves only to find out that they are still wet with sweat. Air drying the gloves is an option if you have the time as this will let them dry naturally and won’t affect the material. In order to do this, you want to make sure that the wrist straps are open so that as much air is getting to the gloves as possible. Keeping them in a well-ventilated room or by some fresh air will aid the drying process. One thing you don’t want to do is leave them out in the sun, as this might also damage and crack the leather. If you’re in a rush, then using a hand dryer would be an option, but this needs to be done with caution as too high a heat might damage the glove. If your dryer has a cooler setting then this should be used, and if it doesn’t have one then it needs to be done at a greater distance. Due to that fact that prolonged use might damage your gloves, this should only be done in short bursts and you should check out how dry your gloves are regularly. If your gloves still have a lot of moisture inside them, then using something like newspaper will help absorb some of that moisture, but also help keep the gloves open so more air gets to it. Using something like a towel wouldn’t work as well as this would block the air from leaving the glove. This step should be repeated if the newspaper gets too wet. There are plenty of things you can use at this stage in order to make your gloves smell nicer, as there might either be a dull smell or the slight smell of the cleaning solution that you used. There are solutions out there that will keep your gloves and smelling good such as baking soda or cedar chips, but pulling out your gloves and taking out your cedar chips might get you a funny look from everyone else. Using a few sprays of deodorant or a popular odour remover will easily do the trick. If you want to use an anti-bacterial spray, then you need to make sure it can be used with the materials on the boxing glove. A spray wouldn’t be preferred as it’d be hard to make sure that you got every part of your boxing glove covered, which is why creating a solution with that you can wipe with a cloth on the inside of your glove is a preferred method. You see some websites that claim that you should freeze your boxing gloves which may sound like a crazy solution, but it does actually work to kill bacteria. The negatives here though are obvious. If there is too much moisture left in your glove then it will turn them into a block of ice and there are plenty of sharp edges in a freezer which could damage the gloves. Added to that, imagine if you forgot about your gloves or needed to use them immediately? That would be very unpleasant indeed. Finally, who has space in their freezer for two boxing gloves? Quite simply, while freezing does kill bacteria, don’t try this at home as the famous saying goes. It may be tempting to use silica gel, but while this can be effective to some degree, it is too hard to control and the amounts needed would make this very difficult. Silica gel can absorb around 40% of its weight in moisture, but it will do that for all the moisture including what is already in the air. If your gloves are quite wet then a lot of gel would be needed which might affect the leather, but also might leave your room without any moisture. Check out the video below for some great tips on cleaning your gloves! So you don’t fancy going through the whole process every time that you come back from the gym? Fair enough. If there is any time that you can be forgiven for being a little lazy then it’s after boxing training as it can be a draining experience. Barely able to walk after you come out of the gym and your arms almost being too heavy to control a steering wheel. While a proper cleaning is important every now and again, there are a few shortcuts that you can take to keep them going between proper cleans. As discussed, the initial priority is to make sure that you don’t leave them in the gym bag as this will be a breeding ground for bacteria. After your session, throw them in your bag and take them out as soon as you get home. Put your wraps in the washing machine and then put your gloves in somewhere where they can dry without stinking your home out. When it comes to the next day then you can use an anti-odour spray if you wanted to use them right away. If you have a little more time, then give them an anti-bacterial spray as soon as you can as this will help keep most of the bacteria at bay, even if they don’t have a 100% success rate. This is not the best way to clean your gloves, but it will at least take most of the bacteria away until they can be cleaned properly. How often you should properly clean your gloves is up to the individual, but your sense of smell will be giving you the best indicators of when you should be taking the steps to clean them. Everyone trains different, and some people sweat more than others so it will be different for everyone. No-one wants to have to clean boxing gloves, but it’s essential for your health and also to keep everyone else from having to suffer from the smell of your gloves. Taking these steps will ensure that the bacteria are kept at bay and the terrible smell that goes with it. Previous articleWhat Is Sparring In Boxing & Why Is It Essential! Next articleVenum Elite Boxing Gloves Review: Our Thoughts!